Steven Van Zandt aka Little Steven aka Miami Steve recently apologised for the gap of nearly twenty years since his last solo release. To be honest this refreshing approach is welcome, but unnecessary, as Steve had hardly been spending his days sipping cocktails, while counting his money, on some far flung beach. In the intervening years Van Zandt has successfully worked as an actor, first catching the attention of the masses in The Sopranos and followed that with the fish-out-of-water gangster tale Lilyhammer. He also found time to turn his hand to radio as a DJ / program director (Underground Garage / Outlaw Country) and launch his own record label (Wicked Cool Records). Then there is the little matter of his day job with the E Street Band. Does this man ever sleep? Despite all these intertwining career choices Steven Van Zandt is probably still best known as an integral part of the E Street Band, his relationship with Bruce Springsteen dates back to the 60s when he first worked with Springsteen in Steel Mill and The Bruce Springsteen Band. In the mid 60’s Van Zandt was already a respected figure on the New Jersey club scene when his career path crossed with The Boss. He would eventually join the E Street Band in 1975 but still found time to be an essential component of the early success enjoyed by Southside Johnny and the Asbury Jukes, adding considerable production and songwriting expertise to their late 70s output. Forty years on those early Southside Johnny albums would prove to be a vital part of the 'Soulfire' story. I hope you’ll forgive me as I take a little trip down memory lane. My first recollection of Little Steven and the Disciples Of Soul dates back to hearing 'Lyin' in a Bed Of Fire' on, probably, the Friday Rock Show (I’m guessing here as the memory isn't what it once was) and rushing to buy the album 'Men Without Women' from which it came. I have great, if hazy, memories of catching a live show when they appeared as special guests of Thin Lizzy at the 1983 Reading Festival (that weekend is now all a little hazy, not just Little Steven). Second album 'Voice of America' was as impressive as the debut, despite a marked change of musical direction, but I'm afraid to say I did lose touch with the solo career as the gaps between albums got longer. For 'Soulfire' Little Steven has embraced his past, reaching back through the years to cherry pick a few gems he's written for acts such as Southside Johnny and Australian legend Jimmy Barnes (a raucous 'Ride The Night Away' with added soul). To perform the songs a new Disciples of Soul has emerged complete with brass section and a trio of terrific backing singers. The result is an album, the like of which you rarely hear these days, that effortlessly blends rock, blues and soul. 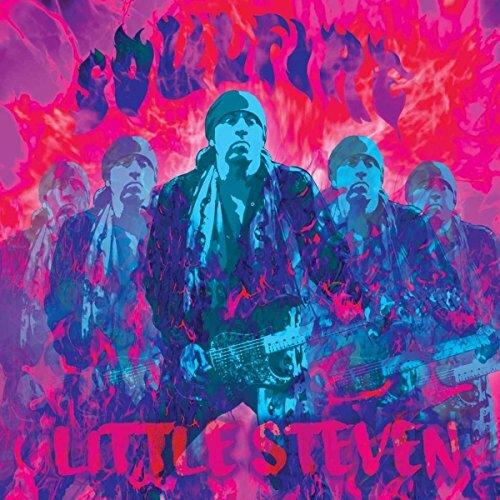 'Soulfire' really is exactly what you want from a Little Steven record. Opening with the title track ‘Soulfire’ immediately wins the listener over as funky guitars, pounding percussion and organ lay the bedrock for a Little Steven vocal unchanged by the years. Throw in soulful backing vocals and a surprisingly abrasive guitar solo and you have as positive a listening experience as you’ll hear this year. ‘I’m Coming Back’ follows and, as it was originally recorded by Southside Johnny — after he and Steve had been on a fifteen year break — it’s ideal for this new record. Personally, it’s just so great to hear Steve rockin’ out with the big band sound that I loved back in the day. Next up Steve takes a side step utilizing a traditional Chicago blues sound on an extended ‘Blues Is My Business’ originally recorded by blues great Etta James. The band gets plenty of room to stretch out here with some terrific interplay between organ and guitars. The art of the songwriter is a really interesting one as ‘I Saw the Light’ is all horns and sha-la-la backing vocals but Steve originally wrote it for possible inclusion on a Richie Sambora & Orianthi album. It would‘ve definitely been interesting to hear how the Sambora version would have turned out. ‘Some Things Just Don’t Change’ returns us to the early days of Southside Johnny and has a lovely Motown feel. The breakdown mid song is especially effective while, throughout the song, the drummer makes some really interesting and effective time choices. Next up is the Springsteen co-write ‘Love on the Wrong Side of Town’ which Little Steven treats with due respect but adds considerable verve to the original, slipping in a guitar solo and adding, even more, soul to what was always a great tune. Little Steven has always embraced the history of rock n roll and ‘ The City Weeps Tonight’ is doo-wop that was originally intended for ‘Men Without Women’ but finally sees the light here. I would imagine that growing up Little Steven listened to many hits on the radio from a host of groups named after birds and cars which is no bad thing. The exploration of great American music continues with an absolutely wonderful run through of the 70’s James Brown track ‘Down and out in New York City’ all choppy, funky guitar lines straight out of Shaft (well actually the ‘Black Caesar’ Blaxploitation film) married with throbbing bass and quite wonderful horn parts. This is really great stuff and a definite highlight of the record. The Gary U.S. Bonds tune ‘Standing in the Line of Fire’ is next up but you’d struggle to initially recognise it. The track now opens with an electric guitar part straight out of an Ennio Morricone Spaghetti Western and this motif continues with the horn and guitar interplay during the mid-section. It’s a little out there, but still really kinda cool although diehard fans of the original might disagree. ‘Saint Valentine’s Day’ a rock / soul hybrid follows. I’m not entirely sure about this as the tune sounds like a straight forward rock song while the backing vocals, though soulful, exhibit an almost new wave feel which is interesting, I’m a little unsure about some of the elements but the addition of horns saves the day. The album concludes with the one-two punch of the classic ‘I Don’t Want to Go Home’ which was the first song Little Steven wrote and appeared on the debut Southside Johnny album back in 1976. The band is once again on top form adding verve and punch to revitalise the song. Lastly ‘Ride the Night Away’ has always been a great track, but then I’m a long standing Jimmy Barnes fan and bought ‘For the Working Class Man’ back in the day. This new take on a classic is grounded on pounding drums and hard edged guitars but Steve has injected added soul via his horn section and the song is extended to form a fitting conclusion to the album. For his first album in nearly twenty years Little Steven has effectively drawn a line under his previous musical offerings and started fresh by looking back. This interesting approach might surprise old fans but bolstered by a top notch band, that attack the material with verve and vigour, this really is an outstanding album and comes very highly recommended.